Who is Baoshida? If you have never heard of them before, then as a Swiss it is high time to get interested in China: They are the savior of Swissmetal. Through their acquisition jobs could be saved in Switzerland. In the past Switzerland was mainly known amongst Chinese for its natural landscapes, but nowadays Chinese investors become also interested in Switzerland's attractive business landscape. Chinese companies starting to open branches in Switzerland and acquire Swiss companies. First of all Chinese are interested in the luxury and metal industry. Luxury hotels or the wristwatch industry are on top of the list. Secondly green energy and commodities are of big interest. One example is China's petrol giant Sinopec: They paid 7.3B USD to acquire the Geneva based Addax Petroleum. Based on information of the Swiss magazine L'Hebdo, 60 Chinese companies are already in Switzerland. China holds huge dollar money reserves. This enables them to invest in foreign companies. 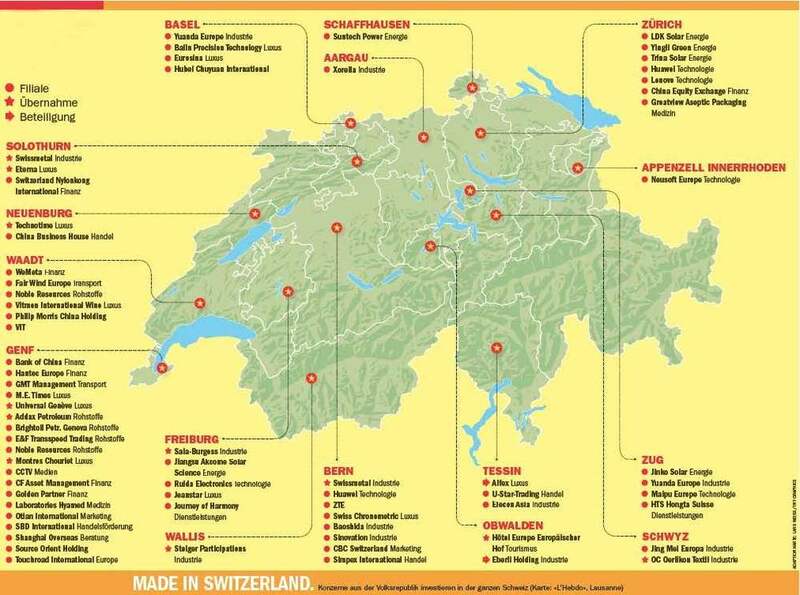 On the map created by L'Hebdo, the presence of Chinese companies in Switzerland is clear. In the future, this trend should become even more important. This development is a double edged sword. On the one hand, critics fear the competition and power of Chinese companies, such as Jinko Solar, that are now operating in the middle of Europe. On the other hand, Chinese companies such as Baoshida are saving Swiss jobs. Altogether, the importance that Chinese companies might take in Switzerland in a close future has to be taken into consideration by politics and investors.